There are a lot more "wild" cats in Japan than any other place I've lived. They aren't wild as in feral, but they don't have owners. Or, rather, they're often just neighborhood cats - they live in the area and are sometimes fed by the locals. When I lived in Tokyo, there were a bunch of cats near my dorm that would meow at me as I walked by. I usually didn't have anything to give them. Here it's the same story, though I've thrown them some pieces of ham, on occasion. There's this parking lot near my house that is usually empty save two or three cars; not really sure whose lot it is. 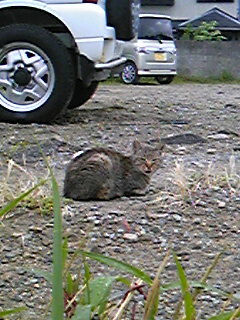 Often I'll see a cat or two hanging out there, though they also frequent the gaijin traps in the area, too. Today as I was walking home, I passed by the lot and saw this little gal (I'm just guessing because she had a high-pitched voice). I started talking to her and she meowed at me. I guess she's hungry, but I don't really have anything to give her (don't think she'd like a grapefruit or some veggies). Sorry, cat! Some of thems are more skittish than others, and I recognize a few of them now. Don't think I've seen her before, though. Next time I go to the store I'll look for a little something I can give a hungry cat. Don't give them cow milk. I once gave some milk to the stray cats and the next day, they 'brought out' the tapeworms in them. Ew. Yeah, I'll avoid that. Thanks, Rene! Me too. Dogs are cool, but just have a soft spot for cats, myself. Plenty of strays here in my place. A bunch of us would try and feed them. Will remind self to avoid cow's milk. When I lived in Kamakura, I always looked for the neighbourhood cat that everyone knew. Very friendly and enjoyed spending time with everyone. Since I moved away, I haven't gotten to know any neighbourhood cats. There is a possible one that my girlfriend and I found meowing very loudly. It seemed friendly and was quite hungry. What is the origin of the term "gaijin trap" as it applies to deep ditches? I've never heard that term before in my 22 years in Japan and can't for the life of me figure out what ditches have to do with foreigners. They can seem quite pitiful sometimes, which I guess is why people feed them. I think they're nice to have around, though. Hey Orchid! It may not be an official term or anything...just a word I've heard tossed around by some local foreigners to refer to those big gutters. Could be because some friends of friends have "almost died" accidentally riding into them in the dark. I understand cow's milk can actually be very hard for cats to digest, so tapeworms aren't the only good reason to avoid it. It's probably not universal, but I have a cat that really adores bread, so if you've got some around that might be worth a shot! Bread, huh? Interesting. Is that ok for cats, though? I know a lot of breads aren't exactly good for people, though we eat them. Thanks for the comment, FT! Ha, well, I guess a cat's gotta eat. Ah, yes! Nearly forgot about that. All the Murakami books run together for me and I forget details. Is that the one where it rains fish? I always call them gaijin traps, as do the other foreigners I know. I forgot that wasn't their real name :). This entry reminds me of a blog I like to read sometimes: www.cats-blog.com/. It's by a person who just takes their camera around with them in Tokyo and takes pictures of cats. The captions tend to be pretty funny and it's good Japanese practice. Wonder if it's a regional thing within the foreigner community. Heh, silly cats. Thanks for the link, Joe! My guess is that it is regional, not because foreigners in Kanto wouldn't fall into them, too, but rather because I've never seen those types of ditches in the Tokyo area. Haha! Damn, wouldn't want to run a car into one of those. Then again, wouldn't want to run anything into one. Some cats are very good with human beings because some adults give them food. Public health department is annoyed them from the aspect of good hygiene. My children and I care cats living in our neighborhood. I think it's good to take care of those cats...I mean, if they become overpopulated, I could see a problem. But I imagine they help keep the crows in check, for one.